WASHINGTON (CNS) — Two prominent Mideast church leaders told a U.S. audience that they were looking to the United States for leadership to obtain peace in the Middle East. 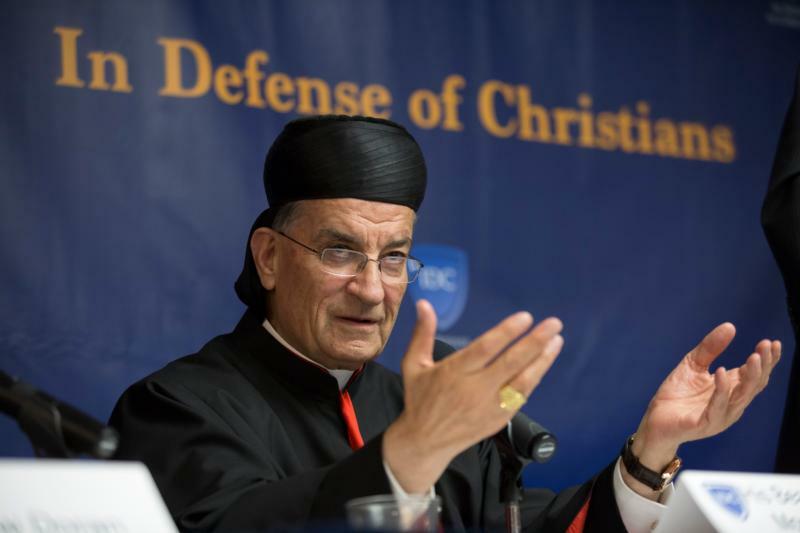 “We look to America to lead the international community in so many ways,” said Lebanese Cardinal Bechara Rai, Maronite patriarch. At an Oct. 24 media conference kicking off the In Defense of Christians Summit in Washington, the cardinal and Greek Orthodox Patriarch John X of Antioch and all the East told a crowded room of church leaders, politicians and media at the National Press Club that Middle East residents were looking for the United States to push for peace, especially in their region. Yet he and Patriarch John insisted that Middle Eastern nations must be involved in coming up with a solution. “We hope the Palestinian crisis will be resolved soon, but not at the expense of Lebanon,” said Cardinal Rai, emphasizing that Lebanon needs to be involved in negotiations. He noted that his country has been at peace for years, but that peace is fragile. Many Lebanese have said the number of refugees in Lebanon — proportionately equivalent to about 150 million people coming to the United States and needing care — is straining that peace, as well as the nation’s infrastructure and resources. Lebanon’s proximity to conflict zones and its hospitality have made it a haven for those fleeing violence. Southern Lebanon shares a border with Israel. Eastern and northern Lebanon borders Syria; from Damascus, Syria, to the border with Lebanon is only 15 miles. “We have been abandoned to solve the problems we did not create,” he said. “We have a long tradition of pluralism in the Middle East,” he said, but that has eroded in recent years. Patriarch John also emphasized the need for people of the Middle East to be involved in peace negotiations. “Living in security and peace is a right of people of all the world,” said Patriarch John, noting that the hands of terrorism were stretching to Europe. However, he said, church leaders wanted Middle Easterners, especially Christians, to be able to return to their homelands. Without specifically mentioning the exodus of Middle East refugees to Western nations, Cardinal Rai said people always speak of refugees living in human dignity, yet countries closed their borders and left families in the rain and the cold. He asked if it was enough to give a family a tent and food. “If they really want human dignity, the first thing they have to do is stop the war” and allow people to return to their countries, he said. Both church leaders emphasized that Christians in the Middle East were working together, through groups like the Middle East Council of Churches, but also with Muslim leaders. Responding to a question about the creation of safe zones for Christians in various countries, they said they did not want to be split from their neighbors. “We want Lebanon to be one Lebanon, and one Syria, united, and one united Iraq,” said Patriarch John. The summit includes an ecumenical prayer service and multiple seminars, with policy advocates and politicians, as well as speakers from the Middle East. Vice President Mike Pence is scheduled to be the keynote speaker at a banquet Oct. 25. Participants will travel to Capitol Hill Oct. 26 to lobby congressional leaders and speak with administration officials.